Halloween isn’t just about dressing up, trick-or-treating, or watching scary movies. You can also cash in on some of your skills and hobbies to make money on or around the holiday as well. Saving and making more money during the fall season should be a priority if you don’t want to get into holiday debt around Christmas. If you don’t have any plans for spookiest day of the year, why not use it as an opportunity to make extra money instead of hiding in your home after you’ve given out all your candy? Luckily, you can make money around Halloween and still join in on the fun if you can hustle and be creative. Here are 7 ways to make money on Halloween or the week of the holiday. Have old costumes that you or your kids no longer want to wear? If they’re still in good condition, you may be able to make some extra money by selling them online. My son wears his costume to a few events and for trick-or-treating each year, then he never wants to wear it again and always wants a brand new costume for the following year. I don’t blame him, but it creates clutter after a few years when it could generate some extra money for us instead. You’ll have to list the items in advance to allow enough time to ship them if you’re using a site like Amazon or eBay. If you’d prefer to do a local pickup transaction, list your costumes on Offer Up or the Facebook Marketplace. Whether you have a full-time business or sell a product or service on the side, passing out business cards can be a great way to spread the word and reel in some leads. One of the easiest ways to do this is to attach your business card to the candy you hand out on Halloween. Odds are, most parents will sort through their child’s Halloween candy at the end of the night. They will likely see your card and can reach out to you if they need your help or are interested in working with you. Parents may find it difficult to cover all their bases on Halloween night when it comes to taking the kids out trick-or-treating or handling the pets. You may be able to earn some extra cash by offering babysitting or pet sitting services. This could be extremely profitable if parents have a new baby they’d prefer to stay home or if they want to go out themselves on Halloween weekend. Adults like to indulge in the fun just as much as kids do. If parents are planning on attending a Halloween party, you can offer to babysit for them and make some extra cash. Haunted Houses will get busier and busier as Halloween approaches. If you don’t mind dressing up and scaring people, this could be an easy way to make some extra cash. Most haunted houses will hire actors as young as 16 years old. You can expect to make anywhere from minimum wage to $25 per hour depending on experience and the tasks you’ll be doing. You can make more money at a facility that offers more attractions like haunted corn mazes, zombie paintball, concessions, ticket sales etc. because you’ll be able to work on a variety of tasks. Some Halloween lovers enjoy taking their costumes to the next level with extravagant makeup and creative face paint. If you like art and can do a good job in this area, you can make extra money doing Halloween makeup for parties and events. You can market your services as a freelancer or apply for seasonal employment with a Halloween store or event facility. My husband has been driving for both Uber and Lyft for the past 2 years and always experiences a big surge in pick up requests on Halloween day and during the weekend surrounding the holiday. If you are at least 21 and have a car that meets standards, you can start driving for either company or both and make a good amount of money during the Halloween season. If you’re comfortable with driving in the evening, try to hang out around areas that are hosting a lot of seasonal adult entertainment and Halloween parties. If you’re creative or like to bake, consider putting your Pinterest skills to the test and creating some custom Halloween crafts, gift baskets or decorations that others can buy for their parties and events. You can design t-shirts, backdrops, photo booth props, table centerpieces, etc. You can also consider baking some Halloween-themed treats to sell to last-minute party hosts and partygoers. Market your creations with your Facebook or Instagram page. 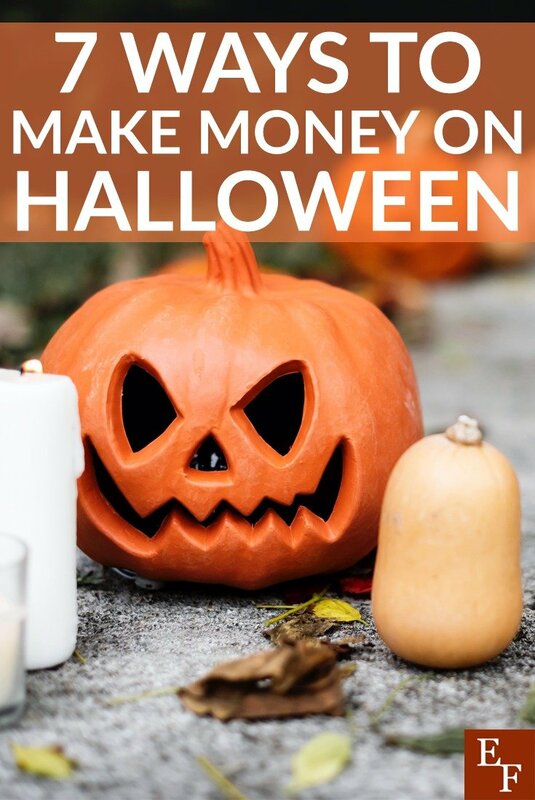 Have you thought about making any extra money on Halloween? Which one of these ideas could you see yourself doing?